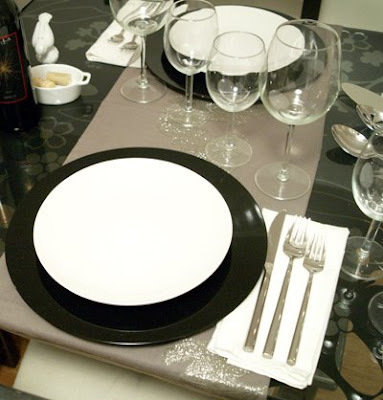 Setting the table for dinner guests can add an instant touch of sophistication to the most casual of get-togethers, and since I find it particularly satisfying to arrange (and rearrange) plates, napkins, glasses, and flatware; I'm prone to doing this even when we're just having lasagne. 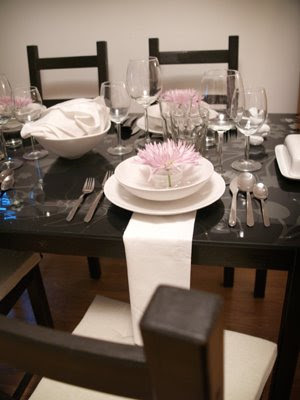 I grabbed these lavender-colored spider mums from the grocery store thinking they'd look cute in a centerpiece but after setting the table I made a last minute switch to individual blooms in some glass votives we had on hand. Our table and chair set we purchased from IKEA a few years ago and the glass tabletop is actually from their office desktop collection, but I snagged it in the as-is section for about $10. The runners and chargers I picked up at Target while they were having their after-Christmas cleareance so I got those on the cheap too. The flatware was my gift from Timothy for Christmas and we were ecstatic to have friends over so we'd have an excuse to lay the table with them!